Palmistry or hand reading is the art of foretelling a person’s future by reading the lines in the palm of their hands. This ancient practice has been found in the historical cultures of India, Tibet, China, and other places in Eurasia. Its philosophy is that our life path is predetermined before we are born and the energy imprint is mirrored by the palm of your hands. If you know how to read their lines you can see into the life of a person. One area of life that this practice touches is a person’s emotional aspect, otherwise known as the matters of the heart. This is the heart line that represents love and attraction. When you look at your palms, it’s the first line you see directly below your fingers. If you’re curious about your love life or how your marriage will turn out, let’s have some fun and do this exercise. 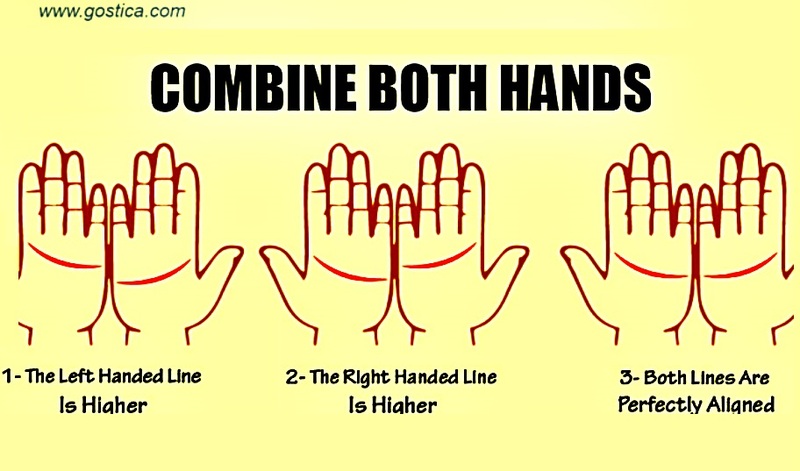 Compare your left hand with your right hand by placing both palms in front of you. 1. If the line on the left hand is higher than the right, it means you are a fighter for love. When it comes to love, challenges never scare you. Where others see a challenge, you see an opportunity. You take every challenge as an opportunity to show others that you know how to claim what is rightfully yours and easily takes away every obstacle along your way. Others may find you aggressive but this is just how passionate and fiery you could become when it comes to love. Having a higher line on your left palm also means you could be an excessively beautiful woman or good-looking man. 2. If the line on the right hand is higher than the left hand, it means you are an old soul. Old souls are said to be really comfortable being around older people. Because of this, marrying a person who is much older than you is likely to happen. You don’t have any problem doing things a bit differently from what people are accustomed to. You choose to see others in their genuine self and not by how they try to present themselves to you. As straightforward as you are, you speak your truth in a direct manner. 3. If both lines are perfectly aligned, showing a perfect curve, this means your heart is as pure as a child. Being pure at heart, you are very gentle with yourself and in the way you treat others. By knowing you, people are reminded of the beauty of humanity. Your sensitivity makes you an empathetic person. People love to come to you for comfort when they feel depressed or to want to have someone to lean on. You tend to choose a partner or marry someone your family and circle of friends accept with open arms. Changes in life, whether minor or major, make you uncomfortable. Despite everything, you are able to manage your way and always end up much better than before.